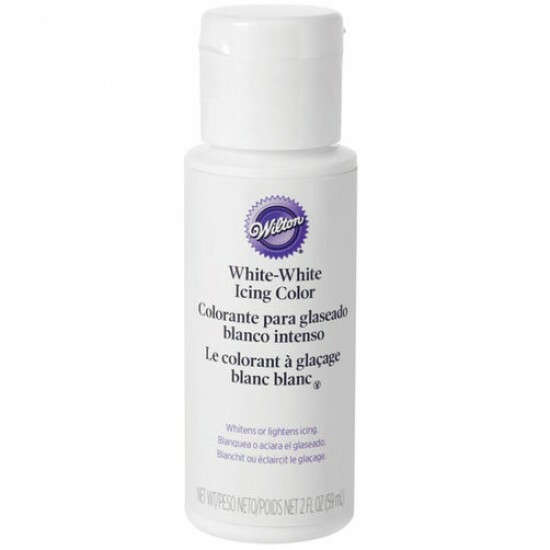 Wilton White White, 2oz bottle of white icing colouring. Stir in to whiten icing made with butter or margarine. Also helps to reduce yellow tones when colouring butter cream so you get a true colour. Can be used in white chocolate ganache, just colour the cream before mixing with the chocolate. Americolor Bright White Gel Colouring Americolor Food Colorings are Soft Gel Paste colorings. Soft Gel Paste™ represents a completely new approa..
Americolor Teal Gel Colouring Americolor Food Colorings are Soft Gel Paste colorings. Soft Gel Paste™ represents a completely new approach to fo..
Americolor Electric Purple Gel Colouring Americolor Food Colorings are Soft Gel Paste colorings. Soft Gel Paste™ represents a completely ..
Americolor Electric Green Gel Colouring Americolor Food Colorings are Soft Gel Paste colorings. Soft Gel Paste™ represents a completely n..
Americolor Sky Blue Gel Colouring Americolor Food Colorings are Soft Gel Paste colorings. Soft Gel Paste™ represents a completely new approa..
Americolor Electric Blue Gel Colouring Americolor Food Colorings are Soft Gel Paste colorings. Soft Gel Paste™ represents a completely new ..
Americolor Violet Purple Gel Colouring Americolor Food Colorings are Soft Gel Paste colorings. Soft Gel Paste™ represents a completely ne..
Americolor Electric Orange Gel Colouring Americolor Food Colorings are Soft Gel Paste colorings. Soft Gel Paste™ represents a completely ne..